Surge the most relevant traffic to your website through premier paid search engine advertising. Google has recently changed their search results so that paid advertisements make up the top four results for competitive search terms. If you don’t protect your top search terms with paid ads, you could be losing business to your competitors. 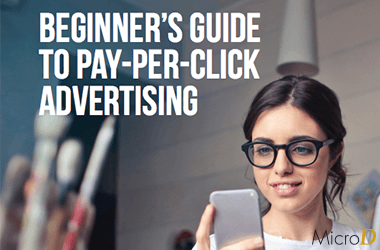 It is easy to create a Pay-Per-Click campaign for your business, but the cost can quickly spiral out of control if you are not experienced or haven’t had the experience of working with a pay-per-click company. As part of our digital marketing solution, MicroD has had years of experience as a pay-per-click company creating successful campaigns that have made our clients millions of dollars. Stop doing bad PPC and let us help you bring more buyers to your showroom. Have you ever noticed the links listed above organic search results? Those are known as sponsored links, or, “Pay-Per-Click Advertisements.” PPC marketing allows you to buy visits on your website, opposed to earning them through organic SEO efforts. This type of campaign can instantly create online visibility when successfully managed properly by yourself or with a pay-per-click company. 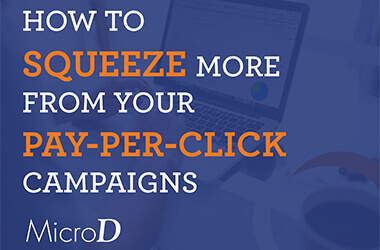 At MicroD, we understand that self-managed PPC marketing campaigns can be complicated, and that’s why our dedicated pay per click management team is here to help guide you towards a budget-friendly strategy for a rewarding ROI. Once our pay per click management team takes the time to familiarize themselves inside-and-out with your business, its PPC marketing competitors, its marketing goals and its vision for future growth, do we then begin work with you as your partner. Together, we will work closely with you to develop comprehensive pay per click service strategies. These strategies use keywords and keyword phrases that target the specific and valuable demographics most relevant to your business. We take these steps to avoid merely going through the motions. Instead, we take carefully placed steps together towards accomplishing your PPC management goals. Our years of experience as a pay-per-click company allow us to help not only local marketing campaigns, but national and international campaigns as well. We generate ads and search results that are specific to your product(s) or service line. Paid Search Advertising should be part of any strategy because it is the only way to guarantee that you will appear in the first position in the search results. Our strategy takes a closer look at who your prime audience is and what industry related websites they frequently browse. Display advertising is a cost effective way to get your brand in front of potential customers. Make sure you are their first brand they think of when they need your services. Since so many users have switched to their mobile devices for internet access opposed to a computer, our PPC agency managers help your business reach those users wherever they are. Most searches are now conducted on mobile devices, but people search on mobile differently than on desktop. Mobile specific ads are the best way to deliver what these users are looking for. Through heavy analysis, we pinpoint the most valuable traffic that is converting the fastest. Only target the users who are best for your business. Find which search terms produce the best sales. Our PPC agency managers will help you target these users more effectively. What’s your return on ad spending (ROAS)? We work to maximize this area, while minimizing the cost-per-click (CPC) to you, the advertiser. Focus your ad spend on the highest margin products or draw attention to a short term sale you are having. PPC marketing gets you in front of more potential customers. Once we begin attracting new users to your website, we plan how to keep them coming back, and better yet – converting into new business! Most users visit your site for a reason. Retargeting shows ads to people who have already visited your site and know your brand, increasing the likelihood that they will convert. Take advantage of sensational subject lines that prompt higher open rates. Email marketing services typically provides one of the highest ROIs in the industry. Target thousands of potential customers for just a few dollars. Increase email performance with designs that increase click-through rates. Increase brand awareness by providing useful information in your emails. Maybe a customer doesn’t need your service now, but they’ll call you when they do. We enhance your conversion rates but blending high quality landing pages with innovative email designs. Find out when people typically open your emails, what they do when they click through to your site and which subject lines produce the most conversions. WHY SHOULD RETAILERS USE A PAY-PER-CLICK COMPANY? Leverage the demand for your products and/or services online. Our pay-per-click company can get your campaign up and running and to #1 on the SERP in no time. While SEO, Email Marketing and Social can take time, PPC marketing is instant. We want to partner with you, not pirate your budget with hidden costs and fees. That’s why our clients value their PPC partnership with us. Cut down on your number of useless leads by implementing extremely well-written content. Improve your targeting. We can segment your audience based on demographic and geographic data and determine which ads work best for them. We know what it takes to bring furniture customers to your door. That’s why our strategy is constantly changing to fit your business goals every week of the year. Does your agency update your PPC every week? Advertising was traditionally a qualitative industry where results were hard to quantify. With paid search advertising, you know exactly what your return on investment is. We don’t give you one cookie-cutter solution. Our certified experts will dive into your PPC and your buyer personas to make better ads with better keywords and better graphics on every platform. We put your money where the customers are. 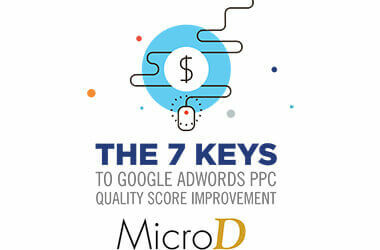 With MicroD’s PPC Marketing Consulting services, our PPC management experts complete a comprehensive evaluation of your PPC structure, performance, and existing use of PPC. Doing this allows us to ensure you are receiving the ideal results from your campaign efforts and if not, we will formulate an alternative strategy more fitting to your efforts. The reality is that not every business needs to hire a pay-per-click company to handle their PPC campaign management. Here at MicroD, we understand that. However, that does not change the fact that there are situations concerning your PPC marketing management where a second opinion from a professional could be the difference between making or breaking the budget of your business. If your internal team requires assistance, our pay per click service professionals are available for a PPC agency consulting retainer. Working together, our team can serve as a fresh pair or eyes to review over your strategies, and implement new procedures from marketing angles that you may have been unaware of otherwise. Shortens learning curve on new PPC trends by working with our experienced PPC agency account managers who remain up-to-date on shifts in the PPC market. Our PPC agency advisors are experts in their field. They keep up to date with all of the latest industry trends and techniques, enabling them to maximize your ROI. PPC marketing expenses can quickly outstrip any cost saving from keeping the management in-house. Our experts will create the most efficient campaigns that save you money. Experience with what it’s like to work with a PPC agency without entering a contract agreement. We know what works. Enjoy the benefit of the experience that comes with years of managing PPC campaigns – no guesswork. Avoid “account blindness” with our PPC marketing specialists that will review and flag any developing negative trends in your PPC campaign. We manage hundreds of campaigns from dozens of companies. Benefit from this large dataset by letting us keep you ahead of the curve in PPC trends.